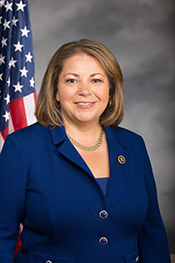 SÁNCHEZ, Linda T., (sister of Loretta Sanchez), a Representative from California; born in Orange, Orange County, Calif., January 28, 1969; B.A., University of California, Berkeley, Calif., 1991; J.D., University of California, Los Angeles, Calif., 1995; lawyer, private practice; executive secretary and treasurer of Orange County, Calif., AFL-CIO, 2000-2002; elected as a Democrat to the One Hundred Eighth and to the eight succeeding Congresses (January 3, 2003-present). "Linda T. Sánchez" in Hispanic Americans in Congress, 1822-2012. Prepared under the direction of the Committee on House Administration by the Office of the Historian and the Office of the Clerk, U.S. House of Representatives. Washington: Government Printing Office, 2013. "Linda T. Sánchez" in Women in Congress, 1917-2006. Prepared under the direction of the Committee on House Administration by the Office of History & Preservation, U. S. House of Representatives. Washington: Government Printing Office, 2006.